Available nationwide, Earn Bank is offering a 2.46% APY Rate for their Money Market Account. The promotion from the bank offers you a rather attractive rate with a low minimum deposit of $100! All you have to do is follow simple requirements and get your rate! Not only that, but you will have complete access to a host of account features to better your banking experience. Are you currently interested? If you are, don’t hesitate! I recommend you apply as soon as you can as the rate is subjected to change! 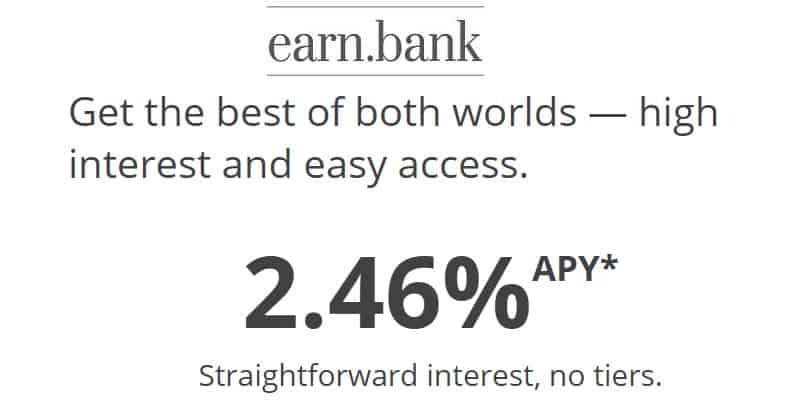 Earn Bank is offering a great APY Rate of 2.46% for their Money Market Account. There is a minimum opening balance of $100 and it's easy to sign up online! I recommend opening an account so you can start saving with a safe and great account that also has a competitive APY Rate. If you are looking for more options. find all the best savings rates from our exclusive list nationwide!